This one is kind of cheating because it was a story I wrote a few years ago, turned into a play. A coffee shop with a barista at work. All the women but Joanne are seated around one table, drinking their beverages. There are people seated at other tables, too, doing the usual coffee shop kinds of things, occasionally getting up to get refills. The fourth wall is a window, looking out at the audience/street. Annie: She always says that. The class goes on and on because she lets it. Dear old Joanne. Linda: Well, I’m glad she’s finally here. I’m pretty nervous about this. Hill: We’ve been over this so many times. Either it will work, or it won’t. Joanne (returns with tea, and looks at Annie’s work) Annie, I can’t believe you’re working on that now. If we mess up, the baby might not need it. Hill: So. Down to business. Can we do it today? The trees are finally all on board, and the maples are especially anxious to begin, since they’ve already mostly lost their leaves and are heading for dormancy. They so want to be part of this, you know. We knew we couldn’t count on the annuals, but the ones still green are willing to do what they can, and the mycelium is all raring to go. Annie: So has the dirt. Bless its heart. Linda: Which is why I’m surprised that it’s been so reluctant. Annie: Agent, then. But you know dirt. It’s always been the most conservative of the lot. Hill: It was brilliant of Sally to suggest the frogs. Annie: No kidding. We can do without an element here and there, but without dirt, this whole project would be doomed from the get-go. And the frogs are the ideal mediators. Sally: Well, it just made sense to me. Mud-dwellers know how critical it is for water and dirt to work together. And they were able to point out that erosion isn’t water’s fault. When this is all over with, it should be much better for everyone–water, dirt, frogs, toads, salamanders. . . those metamorphosing guys are really into this since they’ve got an immediate handle on major change. Joanne: Funny that the rocks are so much more likely to support change. You’d think that being so slow and unaffected, they’d oppose everything. Joanne: They really are. I know them well enough after all these years. I don’t have their complete answer yet, but they always start with either a yes or a no, since they know it takes us awhile to translate. This was most definitely a yes and they continued with a statement about the problems they’ve had with mountain top removal. Even as we speak, they’re going on about their fears about deep-sea drilling. They may be slow, but they’ve seen so much, and they’ve been part of the whole thing from the very beginning, ever since the first sharp-edged tools. Hill: Sally, what about the mammals? Sally: Well, not surprisingly, the bears won’t cooperate. They’re too busy, they say, and besides, they still don’t believe there’s a problem. 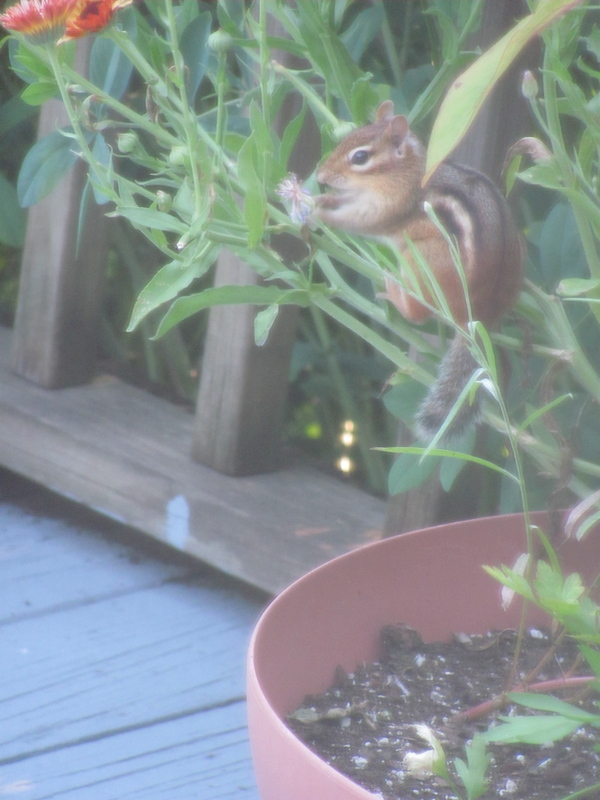 I think they’re addicted to backyard birdseed–it muddles their minds. The deer won’t help, either, which is somewhat surprising, given what we’ve done to them. I think they’re just timid. Hill: We certainly haven’t given them any reason to trust us. Sally: Oh, Hill, I’ve tried to explain things, but they’ve seen too many hunters’ tricks. Their chief told me that now you can’t even count on scent, what with all the masking stuff in use these days. And if you find a good source of apples, well, there’s likely to be a hunter lurking somewhere near by. Annie: You can’t win ‘em all. We knew we’d have trouble with lots of the wild animals. How about the domestic ones? Sally: They’re with us, thanks to the cats. Dogs are about half and half, depending on their masters. Cows. Horses—they’re pretty much a go. No chickens, but that’s no surprise. But— the heroes of the piece are–guess who? Another wild tribe. Chipmunks! People at nearby tables look up. The people at nearby tables go back to their laptops and phones. Annie (still a bit loud) But they’re so cute! (and quietly continuing) They convinced the mice. Hill: Really? I thought they were plotting their own uprising. Sally: They were. But the chipmunks pointed out, quite rightly, that if they joined with us it would save them the trouble of keeping everybody in order. Mice are really good at spreading gossip, but not too good at organizing. Hill: So, we can use their network? Sally: Absolutely. They’re ready now. All the mice in the world are ready. The team in this very cellar is ready to go, the minute we begin. Hill: Excellent .So—we’re ready? (She looks around the table and each woman nods. Then here we go. She places her large blue mug, still half-filled with black coffee, in the middle of the table. The others array their cups around it. There is silence for a long minute while the women gaze quietly at the cups. Young Man (entering from the audience, breathless) The boulder! The boulder that holds up the cannon in the park! I just saw it shake off the cannon! Barista: (soothingly) I’m sure it did. How about a cup of chamomile tea? On the house? Young Man: No! I’m not kidding. It shook it off just like a dog shaking off water. And it’s moving! Look, if you don’t believe me. Several people get up from their tables and go to the window. Some scream. A man: Oh my God! A woman: The planters on the corner. The dirt is spilling out of them and the plants are just kind of rising up in the air. And the water in the fountain has all splashed out and it’s just hanging there. A man: What are all those pigeons doing? There’s hundreds of them! And starlings. All together, flying in circles. Everyone is up, crowding around the window. General chatter: What the hell? Squirrels? Mice? Cats? Look at all the chipmunks! Is that a cow? College student: Oh man, here come the trees. The five women sit at their table, quiet. Annie continues to embroider, placidly. The people are quiet, too, horrified. A woman (holds up her phone and taps at it): It’s everywhere. New York–Central Park–the rocks are coming out of the ground and all the squirrels are lining up, and the trees are marching. And London. The Thames has risen, but it isn’t flooding–the water is just sort of hovering over the banks. Where’s Australia?” She taps at the screen and continues to talk, breathless, unbelieving. The sand all over the deserts, moving. And the kangaroos and things are lining up and marching together. Several other people tap at screens, and the rest continue to report from the window. China. The stones in the Great Wall. Wait! The stones in the church across the street are coming apart, not falling but just hovering. Same as the Thames. The Volga. The Yangtze. Animals in the rain forests—they’re marching around! the Grand Canyon? What the hell? The lights flicker and blink out, the screens go blank. The people stop their frantic chatter and stand where they were, their empty devices before them. There is a long silence, in the dark. And then, music begins. Earth music, with deep drums and animal sounds and wordless melody. And then the people in the café begin to sing, one by one, wordlessly, some of them weeping a little, a little harmony, nothing strident, just everyone trying to make something lovely together, until they are all singing. The lights are slowly coming up, and the house lights come up, too, slowly, and there are people planted in the audience who begin to sing. And this goes on as long as it should. Meanwhile, the five women sit, watching, until the music dies away and the people slowly drift out toward the audience, still humming, holding hands or with arms around one another. Joanne: (leaning over and patting her hand) Only you could put the transformation of the world and an embroidered duck in the same sentence. Annie: And isn’t that the point? Sally (looking in her cup): Tea will never be the same. Linda: Nothing will. Even for us. And we knew what was happening. Hill: Did we? All we did was open a door. Annie:That’s all anyone can ever hope to do. (She threads a needle with red thread) Now I’ll start on the rooster. Awaken early, before the first bird begins to sing. half a blood orange–something of that nature. Wear your softest shoes, your darkest hat. Silence is of the essence, speed not so much. Bring a thimble for water, and string. You will be home before sunset. It is kind, but not necessary. to leave a note. Anyone who loves you will understand. and all the raisins carefully measured and the nuts prepared. and her old boyfriend swished from the closet, garbed like Oscar Wilde. and fine chopped walnuts all across the windy room. Note: I did not shoot or transport them. Two neighbors did that with the ones in their gardens. I know better. . . .there is something that it is like to be a bat. 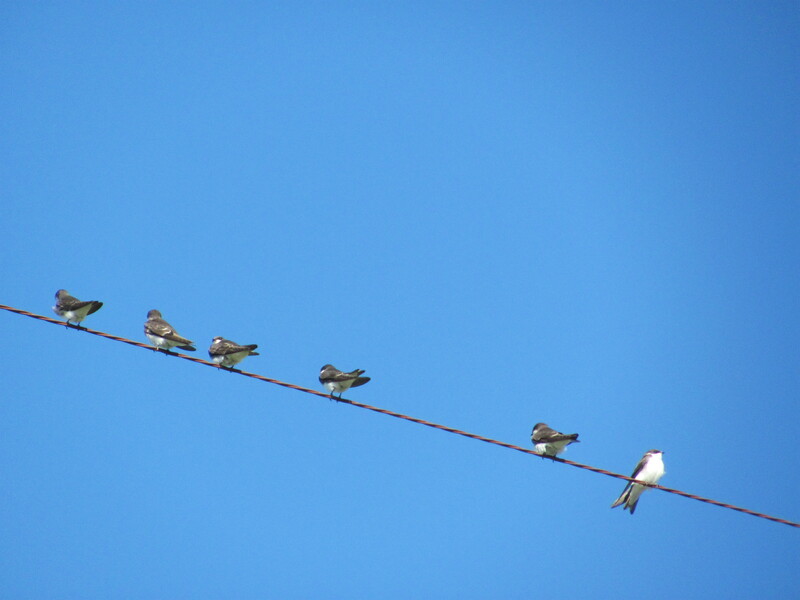 What is it like to be a swallow on a wire? I gaze into the air, let go and float where insects hang. I open my mouth to take one in. dirt and mold-smell clinging to my fur? a porcupine shuffling through the forest, unconcerned. Partridge–I am a great whirring, with open wings. Horse eating wild apples and rolling in the dust. Salamander trying to comprehend the road. I am a bat. I am a bat. I think I am a bat. the center of a swarm of bees. Can you understand the limit of your mind? sorting itself in your plastic brain?